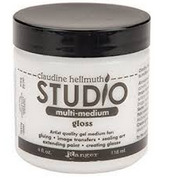 Claudine Hellmuth Studio Multi-Medium is an artist quality gel that can be used for multiple craft projects. Can be used as an all-purpose glue, image transfer, sealer, paint extender, and to create glazes. Waterproof when dry. Acid free and non-toxic. Contains 4 fl oz.